Here's all the recipes listed under Healthy Fruity along with the comments posted by the breakfast lovers that submitted them. "Avocados ARE fruit and they CAN be made into something other than guacamole. I like to use this instead of yogurt. Add more lemon juice if you like the 'twang' as I call it. It's not that weird - I promise!" "A real freash and healthy breakfast treat. I had something just like this on a cruise ship for breakfast once. It's awesome." "Try to find unsulphered apricots, if you can - the fewer preservatives, the better!" 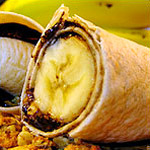 "A great way to enjoy bananas at breakfast. 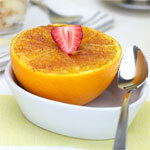 Topped with a little grated coconut and orange zest, this is very tasty." 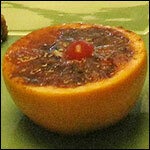 "This is a really easy recipe that transforms a grapefruit into something special and different for breakfast." "If you've never tried it, you'll be surprised how the taste of grapefruit transforms in a wonderful way when it's baked. Enjoy!" "Everything that's great about a Sundae but this one is made with lowfat yogurt, granola and fruit." "So fast to make. So good to eat. Whipped cream is optional by very recommended. It makes the dish look like something from a nice restaurant." "This recipe is from the 1950 Chiquita Banana's Recipe Book. According to the book, this recipe is "Quick 'n' easy... and so different!"" "You could combine the blueberries with other seasonal berries. 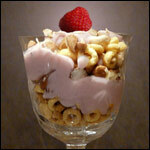 Other variations: try other cereals (even Cap'n Crunch) and berry-flavored yogurts." "This is a perfect breakfast for spring and summer. I am confident you will love it! It's not just a berry, it's a lifestyle!" "Great way to get kids interested in breakfast! 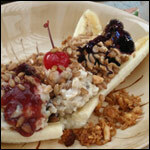 It's a banana split except the ice cream is replaced by oatmeal." "A really great way to start the day. You get grains from granola, calcium from yogurt and more good things than I can count from the fruits. Chopped nuts are optional but highly recommended." "This is a must for any brunch. Fresh fruit is so good along side other breakfast foods." "Easy to make and delicious. A fresh start to any day. Enjoy! I use vanilla yogurt which, by the way, is fantastic just on orange slices alone." "You can also substitute the cinnamon and sugar with honey for a different flavor. I also like to drizzle a little Maraschino cherry juice on the halves at the end." 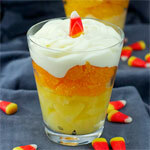 "It might look like Halloween candy, but it's a deceptively healthy, fruity breakfast treat. Great for kids." 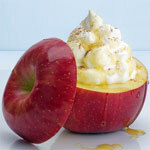 "Apple quality is pivotal to this recipe. I have found fresh Golden Delicious apples to work best." "This is a fun idea for a simple, elegant breakfast dish where grapefruit shells act as decorative bowls." "A simple tropical breakfast dish, very popular in Kerala, South India. Healthy and ideal for picnics or trips." "Try this on Toast - or on roasted turkey leftovers!" "A healthy combination of bananas, strawberries, yogurt and nuts. Very quick to make." "A very interesting way to get prunes in your diet, this parfait has layers of healthy cereal, yogurt and a mixture of prunes and applesauce." 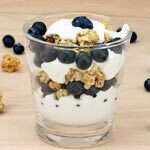 "In France, parfait literally means 'perfect' - which is what you'll be saying after you try this combination yogurt, granola and fresh fruits and berries." "You could theoretically replace the 1/4 cups of various dried fruit with a whole cup of your favorite dried fruit." "A very special breakfast fruit salad. Not a fruit soup as some compotes are." "Perfect for kids! 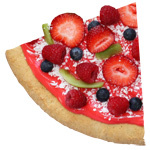 Looks like a pizza, but it's actually granola, yogurt and fresh fruit." 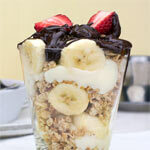 "The honey vanilla yogurt topping is also a wonderful topping for granola in the morning. Granola is also a great addition to the recipe if you'd like a little crunch with your fruit. Try experimenting with other fresh fruits too!" "This recipe can be made partially the night before. In the morning, just chop some fresh fruit and put everything together." "This is sort of like a baked oatmeal, but with rice. It has lots of fruity flavor from banana, pineapple and orange juice. The raisins and cashews are optional but recommended." "This is the most delicious smoothie I have EVER tasted." 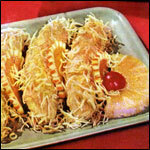 "This is a terrific dish to serve at morning gatherings and meetings. It serves like an appetizer, but makes for a very healthy and satisfying breakfast." 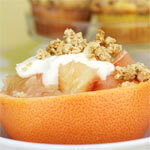 "This is a simple way to add spark to a healthy breakfast of grapefruit. You can use your favorite flavor of yogurt to customize it to your tastes." "You can store this in the refrigerator for 5 days, but it's always best when super fresh." "When you try this Mr B, I bet you start a whole new "Breakfast Soup" section. It's awesome!" "The mint provides a fresh morning wake-up call. Healthy and exciting." "A mix of five fruits with honey, yogurt and pumpkin seeds and little fresh mint if desired." "This is more of a special custom blended yogurt than a smoothie really. You could drink it, but it's probably best enjoyed with a spoon." "You could call this a fruit salad with oatmeal or call it deluxe oatmeal with fruit. Either way, it's a refreshing and healthy way to start your morning." 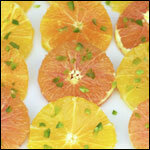 "Spice up your oranges with some chopped jalapeno. A drizzle of honey offsets the pepper so the oranges have just enough heat to surprise your senses. A great breakfast side dish!" "So easy. Just three ingredients. Try different flavored yogurts to make it different each time. A healthy, quick breakfast." 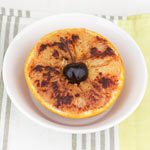 "This is a very easy way to make a fresh tasting, healthy breakfast. It also works great as a snack or a dessert." "I enjoy this particular recipe with some strong coffee, toast, and the morning paper. A great start to the day!" "Sometimes I saute the rest of the banana with the apples and that is pretty good. I have also tried adding frozen blueberries to the apples, also very good." "Great breakfast for when you're on the run. I dig your site! Mr Breakfast rules!" "Pretty as a picture and tasty as can be. Kids love it. Lots of strawberry flavor." 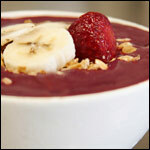 "A super healthy way to start your day - flavorful and full of banana berry goodness. Use any flavor yogurt that you like. We prefer vanilla." "You can also add grapes, pineapple chunks, strawberries or any of your favorite fruits." "Crushed graham crackers top off a parfait of mixed berries and vanilla yogurt." "A healthy donut that requires no baking? Sort of! Definitely one of the healthiest "donuts" you'll ever find." "This is especially good when served warm with a couple Tablespoons of yogurt on top." 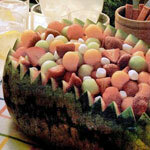 "A must-have fresh fruit dish for any large brunch gathering - especially during the summer. To make it even more healthy, replace the miniature marshmallows with grapes."